Courage Campaign | Join Kamala Harris and Co-Sponsor the Homeowners Bill of Rights! Join Kamala Harris and Co-Sponsor the Homeowners Bill of Rights! UPDATE: We won! A strong Homeowner Bill of Rights was signed into law on July 11, 2012. All Democrats in the California Legislature supported it! California's Attorney General, Kamala Harris, announced a new package of bills dubbed the Homeowners Bill of Rights, a powerful step toward ending the mortgage nightmare the Big Bank's have inflicted on California's homeowners. This package of bills include numerous reforms, including an end to 'dual tracking,' in which banks pretend they are open to modifying someone's mortgage, while -- at the same time -- foreclosing on their home. It will also address the egregious violations recently uncovered showing that 84% of foreclosures in one California county were illegal. 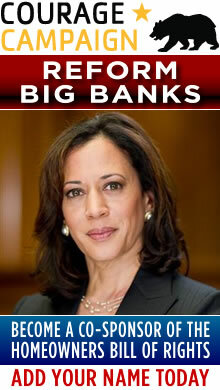 AG Harris knows what we're up against: Big Bank CEOs and their lobbyists, and she needs our help.While she works the inside, we need to grow a mass movement on the outside to make calls, write letters, and mobilize Californians to force our legislators to vote with homeowners and not the Big Banks. Sign on and become a Co-Sponsor! For more details on the various reforms included, please go here.